Packed buses are driving past angry morning commuters - but what can Dublin Bus do? The company says it is reviewing the situation. File photo of traffic on College Green. DUBLIN BUS HAS said it will “continuously review” demand for services amid the capital’s ongoing traffic issues and an increased number of commuters travelling into the city. The start of the new year and the implementation of the new Luas Cross City has seen frequent jams in some areas and changes have already been introduced to help alleviate problems. But other issues have been identified by commuters, such as trams and buses being full to capacity and unable to stop for waiting passengers. While some of the blame for the packed Luas trams has been put on passengers trialling the new service out of curiosity, a similar excuse cannot be made for bus passengers. Numerous complaints have been made to Dublin Bus about commuters waiting at bus stops as packed buses pass them by and some have said that such problems have seen an increase in recent months. Fianna Fáil’s Dublin spokesperson John Lahart TD says he is regularly contacted by constituents who are finding it more and more difficult to get to work. Even this morning, I had an email from a constituent in Knocklyon saying ‘buses full at 8.10 am’, and this is regular. There are other parts of my own constituency, Ballycullen, Scholarstown, developing areas, where there are houses being built. When I moved in there 20 years ago we knew the M50 was coming, so that kind of relieved some of the problems, but there’s no second M50. The increase in traffic problems is reflective of an economy which is growing and 2017 figures from Dublin City Council found that 202,000 people are crossing the two main canals into the city each day. That’s an increase of 21,000 per day compared to 2010 and the worry among commuters is that this problem is getting worse and that agencies are playing catch up with the problem. Asked about whether the service has seen an increase in the past three months, a spokesperson for Dublin Bus said there were 140 million passenger journeys in 2017, an 11 million increase on 2016. “Customer demand across Dublin and the greater Dublin area has increased substantially over the last 12 months,” Dublin Bus said, adding that it believes part of that increase is due to improved service as well as a growing economy. The company said that demand is highest at peak times but refused to comment specifically on complaints about buses being full in the mornings. Lahart says his one issue which particularly irks him is the fact that there is no single authority making decisions on traffic and commuting. The NTA owns all the buses, so Dublin Bus can’t make decisions without the approval of the NTA. My big bugbear is that there is so single entity accountable. You have the NTA, Dublin City Council, Transdev and Dublin Bus. The traders , the public, who do they give out to? The National Transport Authority (NTA) oversees public transport and makes decisions on infrastructural and planning needs. 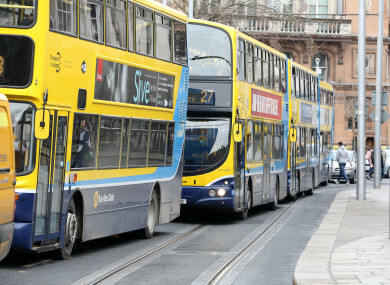 It was in consultation with the NTA that Dublin Bus took the decision to reroute 17 bus routes in an around Dublin’s College Green due to traffic problems. The NTA’s head of public affairs Dermot O’Gara told TheJournal.ie that “it was always going to be the case” that changes would be needed once the actual impact of Luas Cross City was assessed. It had been expected that a vehicle ban would be in operation in College Green by this point, due to the proposed plaza works, but this did not happen because of planning delays. Because of this planning delay the bus rerouting became necessary, O’Gara says. We were basically in a position where we were putting the new Luas service through an old alignment of buses and other traffic. So as a result of the delays in the planning process, it was clear that something other than the plaza would have to change as an interim measure, and that’s what happened. Changes to the routes appear to have had the desired effect with journey times improving and commuters reporting less traffic congestion. Worries are now turning to the introduction of longer Luas trams on 31 March and whether further flow changes will be required as a result. “The real danger is that people get a week or three week’s notice of changes or radical changes that are going to come in. And when you’re trying to change people’s behaviour in a very short period of time it just leads to anger and frustration,” he said. The Dublin South West deputy added that some developing areas should have been “flooded with buses” to show the public that public transport is the way to go and to stop queues at bus stops in morning. Dublin Bus says it “continuously reviews key growth areas” in conjunction with the NTA in order to meet demand. Asked whether Dublin Bus has the freedom to add more buses to a route if demand is there, the NTA said a process is in place where such an application can be made. “Basically, the situation is that they’re (Dublin Bus) under contract with the NTA, they’re the providers, they’re contracted to us. If they want to vary the conditions of the contract, they put a formal process to us and we would consider it and make a detention as to whether it goes ahead or not,” O’Gara explains. Email “Packed buses are driving past angry morning commuters - but what can Dublin Bus do?”. Feedback on “Packed buses are driving past angry morning commuters - but what can Dublin Bus do?”.